“GET CLOSE to people you admire,” exhorted Atlanta-based businesswoman and erstwhile TV talk show hostess, Felicia Mabuza-Suttle, to a sizeable audience gathered inside the Soweto Theatre-Jabulani, Soweto for the second instalment of the Gauteng High Impact Leadership Summit staged in her honour. 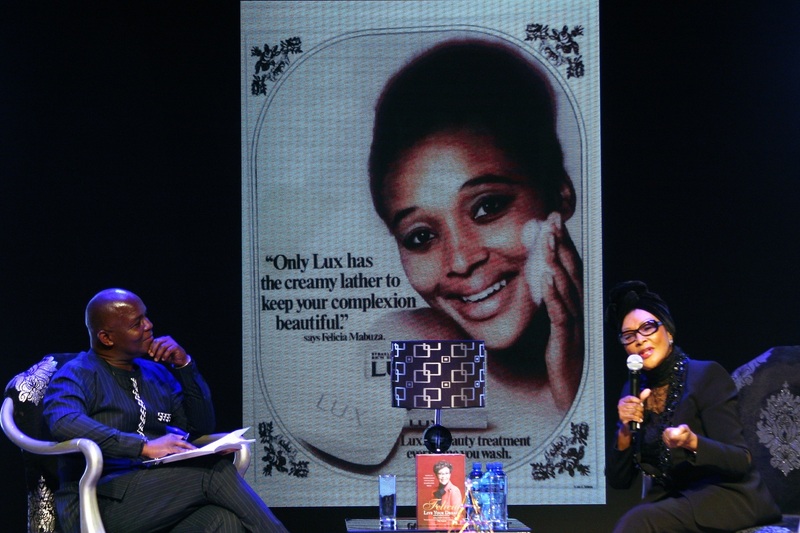 Felicia Mabuza-Suttle explained how she got to feature in a Lux commercial, as brand guru, Thebe Ikalafeng looked and listened on with awe at the Soweto Theatre, Jabulani in Soweto. All images Jacob MAWELA. Once listed among the 100 greatest South Africans, Mabuza-Suttle drove the above point whilst engaged in a one-on-one couch talk with the founder of the Brand Leadership Group, Thebe Ikalafeng – on an early Thursday evening segment of a summit typified by rolling business-themed sessions. The still glamorous grandmother, whose family built the very first double-storey house in Soweto known as Dumakude, would know about ownership of her statement, having crossed paths with a roll-call of the high and mighty who include the queen, the pope, the king [Michael Jackson], presidents [Madiba and Bill Clinton], Hollywood A-lister [Denzel Washington] and fellow media queen, Oprah Winfrey – to mention but a glimpse! Mabuza-Suttle’s conversation with Ikalafeng unfolded under the theatre’s red space’s intimate dim lights, and was interspersed with a technical presentation of picture slide flashes taking the rapt audience down memory lane of her exciting biography. The media component so seamlessly complemented junctures of discussion on stage that, when she delved into her ballroom dancing days – the ambience would be accentuated by a huge image of young dancing couple, beamed in the background. Curiously, the girl depicted in the image was none other than radio presenter, Shado Twala – dressed in a gown, and who appeared to would had been in her pre-teens! Her swing partner, in a “soup-and-fish” [black and white] suit with a bowtie and oozing an “I’ve got this” air, was a gentleman named Manase Mathabathe. Mathabathe, presently a middle-aged fellow, was very much a part of the audience and Mabuza-Suttle in fact invited him onto the stage, to relive the timeline in the early 70’s when he and others were Felicia’s protégés under the Tswelopele Dance Club. Typically dressed to the nines, this time in black, literally from head-to-toe [topped by what she referred to as a Winnie Madikizela-Mandela doek], the dame whose 90’s talk show was once described by mining honcho, Clem Sunter as a place where ordinary people said extra-ordinary things – was very much in the exuberant flow of her element as she recalled the many roles she lived through. There was the 1972 opportunity when she also joined the societal envy ranks as a Drum magazine cover girl and the even international profile coup as a Lux soap model [anyone remember the likes of the very beautiful Marcia Turnier]! With a schoolgirl-esque naughty glint, she even laid the background of how the resume-boosting recognition fell into her lap by chance at a time she was not even the initial choice – when somebody who had admiration for her, actually recommended her. Herself a protégé of Emily Motsieloa [a lady who taught neighbourhood children skills such as music] and brought up in an environment where both her grandmothers sang, the late Barney Simon recruited her to sing and she recalled filling a stint singing with Abigail Kubeka. There was also the period spent as a reporter on The World newspaper, where her newsroom colleagues were the likes of the late Sam Nzima [the photographer who recorded the renowned 16 June 1976 image of a dying Hector Pieterson]. And against the perceptions others held regarding her, she actually also studied for and became a radiologist – only quitting the practise after being overcome by the traumatic images she used to be faced with on a daily basis. Mabuza-Suttle’s life’s second phase played out in the United States where the entry point was helped in no small measure by the generosity of philanthropist, George Soros’ scholarship. Settled in America, the girl from “the dusty and dangerous streets of Soweto” in time got to know what it meant to “Go Dutch” and “bad hair day” through eye-opening experiences which entailed being duped by a date who made her pay for entry to a nightclub – as well as a lady acquaintance tipping her on the imperativeness of always having ones mane groomed, at the expense of hunger! With Ikalafeng intermittently addressing her by the acronym, FMS and how she appeared “unaging”, the lady who admitted to being conscious about her looks confided to the gathering [and to laughter] how her African-American husband of 41 years, whom she referred to as a pillar of her temple, paid for her lobola [dowry] by paying for her studies. 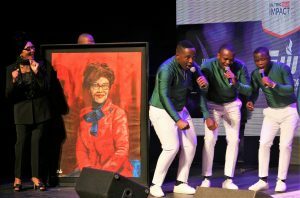 Felicia Mabuza- Suttle reacted to music by Abathandwa at the Gauteng High Impact Leadership Summit held in her honour, at the Soweto Theatre. She provoked mirth by switching to Zulu when she teased, “Unga ngi bambi – ngi khathele!”, in explaining the refusal of conjugal needs of inconsiderate men, unappreciative of the workload such as cleaning, cooking and attending to children women have to contend with in the household – just so that they could engage in what she referred to as “the fifth shift”. Felicia’s sojourn back in the land of her birth was precipitated by an encounter with Nelson Mandela when, on an official visit to the US, he made the clarion call for skilled and high-profiled figures such as her to come back to play a part in rebuilding of newly democratic nation. Also dabbling in the corporate space, she also touched on her South African Airways days, letting the guests in on the process of replacing the old Apartheid-era orange look of the carrier’s livery to the current one – as well as how she agitated for vicissitudes insofar as staff [especially stewards] racial composition went. “Even the police know me!” she exclaimed when she reflected on how, back home, her celebrity status has resulted in concessions from law enforcement such as when she was stopped at a routine roadblock and upon an officer recognizing her – waved her off, within the context of not wasting her time. But that, she clarified, didn’t imply that they exempted her from any scrutiny as others would be subjected to. The lady whom destiny seem to had allotted a trajectory of fame and fortune, what with residing in a neighbourhood which teemed with luminaries such as Dr A B Xuma, Dr Nthato Motlana, Richard Maponya and Gibson Kente – also fondly reminisced of being prayed for by Pope John Paul II, on a plane. Derided by some for undergoing plastic surgery and being an Oprah copycat, Mabuza-Suttle brought it to the present by pointing out that she was saddened by the poverty and crime pervading the country. Before she sat down with Ikalafeng, the programme had been preceded by her being ushered into the theatre by a splendidly clad praise-singer, Jessica Mbangeni and followed by a music tribute by homeboy, Sipho “Hotstix” Mabuse, who alternated between renditions on a grand piano, his trademark saxophone and gospel vocals. Mabuse’s performance momentarily stirred both the honouree and the attendees and it was evident as Mabuza-Suttle, whose own daughter is a musician, displayed appreciation. 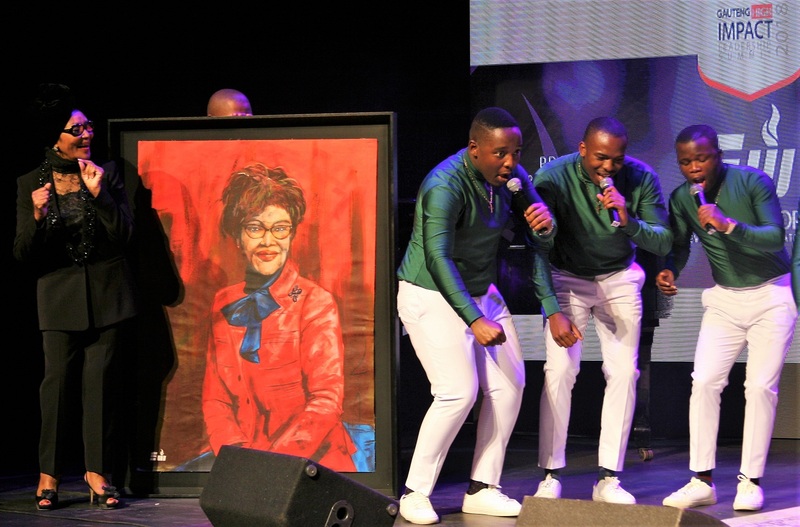 Later, just ahead of a vote of thanks by the summit host, Empowaworx Simphiwe Masiza, a gift of a large oil painting portrait by artist, Sizwe Khoza, of Mabuza-Suttle was unfurled on stage – with the event brought to a stomping climax by the performance of KwaZulu-Natal a-capella outfit, Abathandwa. Expressing her surprise and delight, FMS then wasted no time in enthusiastically getting down to the business of boogieing with the young lads. The honouring of Felicia Mabuza-Suttle happened in the nocturnal stages of the day because, as previously hinted, it had been preceded by a summit which had kicked-off with an address by former Public Protector, advocate Thuli Madonsela. Now a professor at Stellenbosch University, Madonsela delivered a talk masterfully punctuated by proverbs and fables featuring both minute and substantively built creatures. Of course, not long after that, recent history can attest to the implication of those words unto the conduct and ultimate fate of their dispenser! Working from a tablet, the Harvard alumni gleaned implications to South Africa’s state of being from Charles Dickens’ A Tale of Two Cities whilst she suggested that leadership is the art of influencing. Showing an image depicting a caricature of her as the captured black cow of white capitalist [not even properly worded by her detractors] – her presentation was dotted with very insightful and educative bullet points offering a breakdown of words such as EPIC [which were rendered acronym in her appropriation]. Madonsela also let her audience in on other personal insults she was subjected to such as a parliamentary committee member venting that, “Thuli walks on water”, as well as the pseudo staff card purporting to prove her membership of the CIA. Others on the speakers roster included entrepreneur and radio personality, Sibusiso “Sbu” Leope, who lauded Mabuza-Suttle [then dressed in all-white] as classy and dapper. “Home is where the heart is,” he addressed FMS. University of Johannesburg Vice-Chancellor, Professor Tshilidzi Marwala beat the drum of the necessity of South Africa not being left behind in the Fourth Industrial Revolution. Also a scientist involved in many experiments, Marwala pointed out whereas South Africa were spectators of the first, second [when electricity was discovered] and third [electronics period] revolutions – forging ahead, Africans should own their own data [such as his having created software to detect bluffing]. 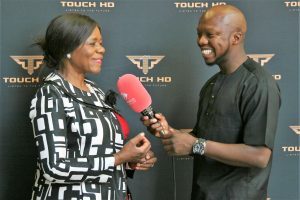 At the summit’s first session comprised of young entrepreneurs and commencing under the subject of building the next generation of global players, Touch HD CEO, Thabo “Tbo” Touch was menacing in his forthrightness. Urging that black excellence was not a pity movement, he underlined on how he didn’t subscribe to sympathy – all the while putting it to the delegates whether they put out quality products for their markets. Touch drew from personal experiences in demonstrating the reality facing the international entrepreneur landscape, unapologetically informing attendees how his products were directed for those with 5-star wallets, as well as how his premium beverages were distributed by respected outlets. “Most of us walk away from the fight, because we see figures,” he rebuked those who easily give up on playing their bit in helping economic growth. 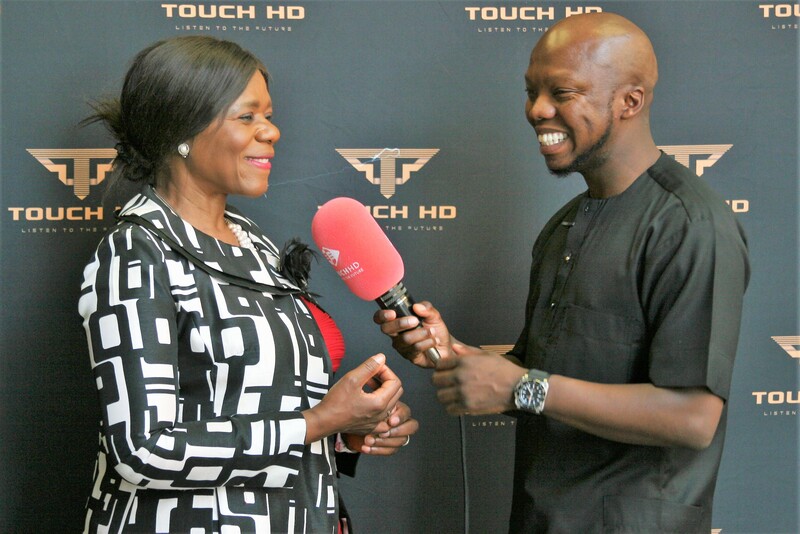 Former Public Protector, advocate Thuli Madonsela, now a professor at Stellenbosch University, sharing an interview with HD boss “Tbo-Touch” Molefe. During a women entrepreneur’s panel chaired by radio talk host, Masechaba Moshoeshoe-Mtolo, former radio presenter and currently Zanenza Holdings CEO, Zandile Nzalo made female attendees privy to funders’ schemes made available specifically for them to get businesses off the ground. “Life is not a dress rehearsal,” she exhorted in a sisterly manner, further urging delegates to own one’s accomplishments. 54 year old Tladi location-raised, LA hustler, Lebo Morake [Lebo M] posed how one could expect to manage money when they can’t even manage themselves. That was at a session which unpacked how South African business contribute to the African economic landscape. The producer perennial associated with Disney’s Lion King suggested that sometimes money was not good for us [Black South Africans] and further declared that South Africans lacked proper self-analysis. Bandying about figures, Morake broke down how a $25 million investment from 15 years ago has accrued Disney some impressive $7,8billion to date. He said that in the intervening years, he has managed to hire more South Africans in the Lion King’s production – further making available certified mentorship within a value chain. Mentioning Ladysmith Black Mambazo as effectively South Africa’s truly entertainment export to the global market, the Grammy Award-winning producer of the opening and closing ceremonies of the 2010 FIFA World Cup, in a disillusioned tone, lamented being caught between Trump and South African uncertainties. Unable to resist applying expletives to vent his state of being, Morake slammed local dumb politicians for the situation the country finds itself in.